Busy weeknights often lead to a run to the local fast food joint or resorting to ordering pizza. 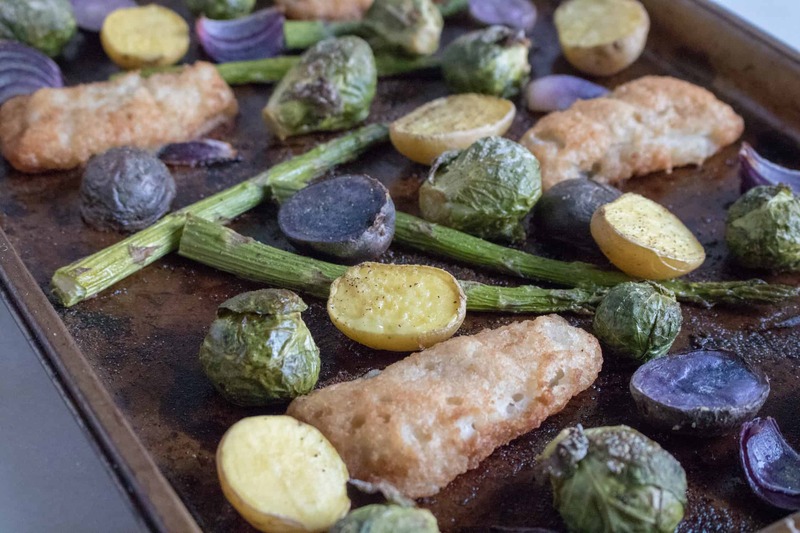 Thankfully, you can avoid the dreaded takeout cop out, because this amazing Sheet Pan Veggies with Beer Battered Fish Fillets One-Pan Meal recipe is the perfect solution to avoiding dinnertime guilt. This is a super simple and super easy meal that you can feel good about. It really does require almost zero effort to make, and best of all, it tastes delicious! 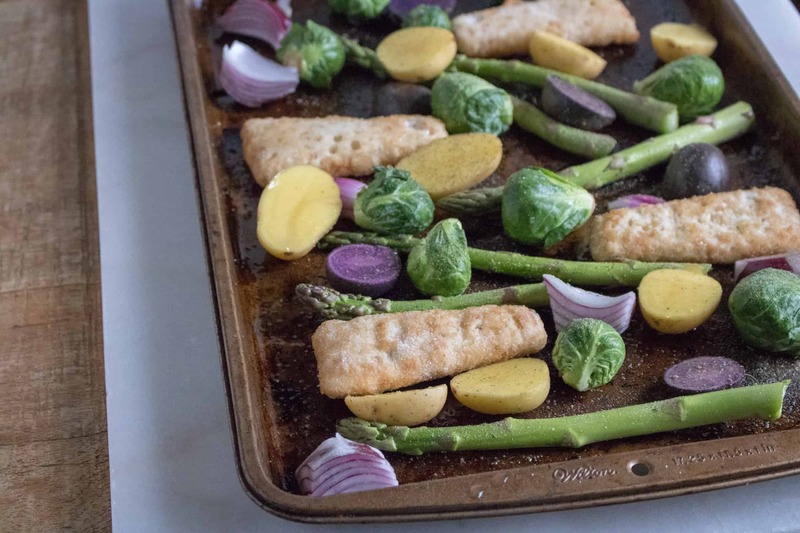 Roasting vegetables (in this recipe we use asparagus, Brussels sprouts and baby potatoes) in the oven caramelizes the natural sugars in vegetables, making them less bitter and more sweet. A perfect kid-friendly way to serve up those good-for-you greens. 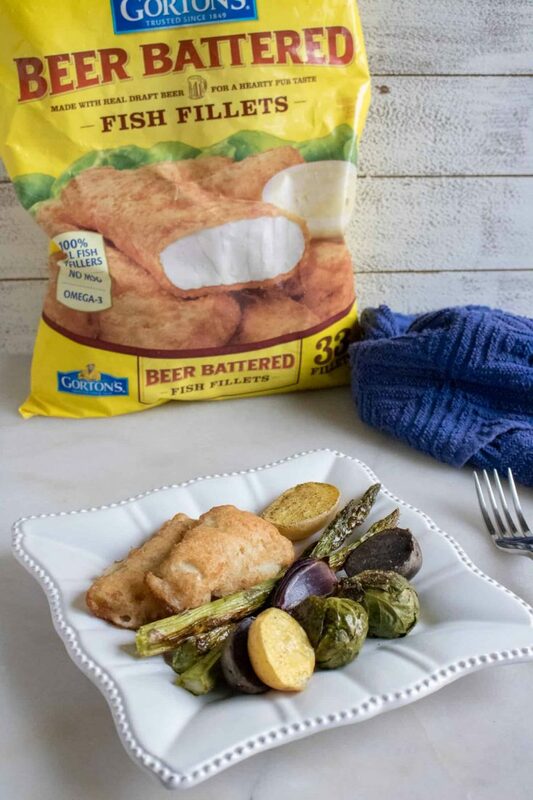 Gorton’s Beer Battered Fish Fillets are made exclusively with wild-caught white fish, which is an excellent source of protein, phosphorus, niacin, and vitamin B-12. 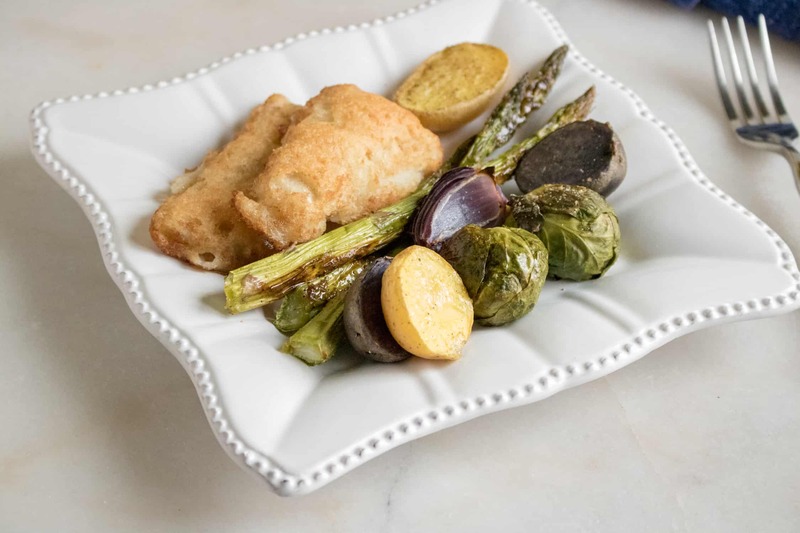 And the classic crunchy breadcrumb coating provides the perfect crispy contrast to the tender, flaky fish. The asparagus is loaded with fiber and folate. And just one serving of Brussels Sprouts provides more than the daily requirement of both vitamin K and vitamin C.
So Easy and So Customizable! The brilliance of sheet pan meals is the simplicity. Chop up the veggies, give them a quick toss in oil, sprinkle on your favorite seasonings (we love using Adobo all-purpose seasoning) add in your fish fillets, and put it in the oven. That’s all there is to it! And you can easily scale these one-pan meals up or down, depending on how many you need to feed. Gorton’s cleverly designed resealable bag makes it simple for you use as many (or as few) of the fillets as you need, then safely keeps the rest nice and fresh for your next meal. One-pan meals are also super easy to customize. You can use virtually any combination of ingredients; instead of asparagus and Brussels sprouts, make it with broccoli and cauliflower. Or try using sweet potatoes instead of baby potatoes. or you can really mix things up and swap out the crunchy breaded fish fillets for either Gorton’s Crunchy Breaded Fish Fillets or Gorton’s Popcorn Shrimp — the possibilities are endless! The brilliance of this recipe is right in the name: you only need to use one pan, which makes cleaning up a breeze! And for those of us who like to make our chores even easier, here’s a great tip: line the sheet pan with aluminum foil or parchment paper, and use enough so that the ends extend up over the edges and your pan is completely covered. This way, you can simply toss the foil (or paper) in the trash — no dishes to wash! Step #1: Pre-heat oven to 425° F.
Step #2:Coat bottom of sheet pan with half of the olive oil. Step #3: Cut Brussels sprouts and baby potatoes in half, slice onion into strips, and trim ends off asparagus stalks. Step #4: Place vegetables and Gorton’s Beer Battered Fish Fillets onto pan, making sure pieces are not touching one another. Step #5: Top with remaining olive oil, and sprinkle with adobo seasoning, salt and pepper. Step #6: Bake for 14 minutes, flip, and bake for an additional 10-11 minutes. 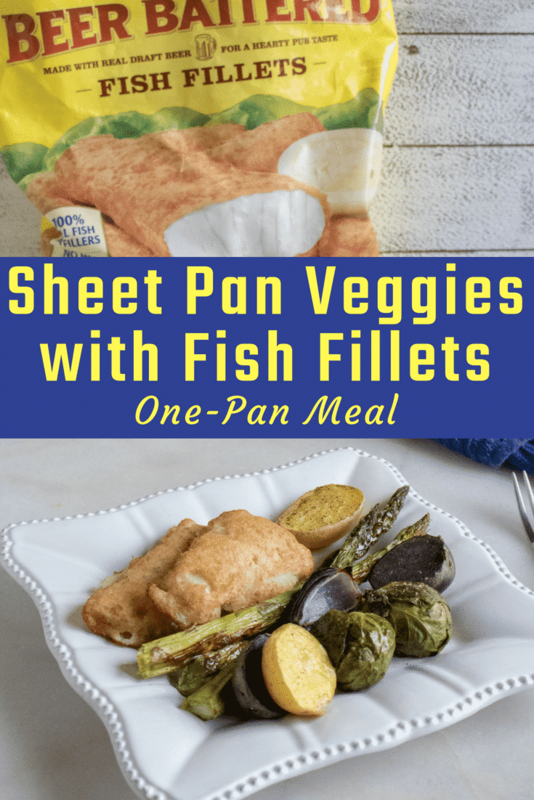 Sheet Pan Veggies with Fish Fillets is quick and easy — the perfect solution for busy weeknights! Coat bottom of sheet pan with half of the olive oil. Cut Brussels sprouts and red baby potatoes in half, slice onion into strips, and trim ends off asparagus stalks. Place vegetables and Gorton's Crunchy Breaded Fish Fillets onto pan, making sure pieces are not touching one another. Top with remaining olive oil, adobo seasoning, salt and pepper. Bake for 14 minutes, flip, and bake for an additional 10-11 minutes.